When I decided to make granola today, I had no idea what I wanted to put in it or what sort of flavor I wanted it to have. I guess you could call my final product a sort of a smorgasboard of ingredients, because I used up what I found in my fridge as far as fruits and nuts goes. I had some raw sunflower seeds, a bit of almonds, and some walnuts...which all found their way into my granola. 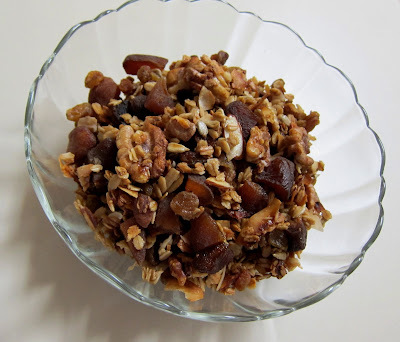 I added some large flake coconut as well, one of my favorite granola add ins, because of it's wonderful flavor and fragrance! I thought honey and almond oil would be nice, to sweeten and crisp, because of the beautiful complexed flavors they add, as well as some almond and vanilla extracts to give it that extra something special. I looked at my spice supply debating whether to add any or not, then the Chinese 5 spice caught my eye! I have never used it in granola before, but I have in just about everything else, so I thought why not this time? 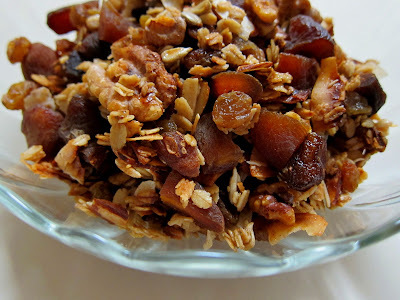 Lastly, I felt that some dried fruit was needed, so golden raisins and apricots it was, since they are both golden in color, and when this granola had cooled it was rather golden...and sunny! Just like the flavor wasn, which is why after tasting it's pure deliciousness, I decided that it should be called "Sunny Honey Granola"! Plus, it does contain sunflower seeds and honey...Make this if you would like a wonderful granola which will definately make you feel sunny when you eat it! Line a large baking sheet with non-stick foil, and spray with cooking spray. Preheat the oven to 350 and set rack at the medium position. In a large bowl, combine oats, walnuts, sunflower seeds, almonds, and coconut, and set aside. In another bowl, whisk together oil, honey, maple sugar, sea salt, 5 spice, almond and vanilla extracts until well combined, then pour over oat mixture and toss to coat until completely blended. Pour out onto prepared baking sheet, and spread out evenly. Bake for 35 minutes, stirring about every 10 minutes or so until the granola is evenly browned. Remove from oven and let cool. Stir in dried fruit, and enjoy! Sunny honey! Who can help but smile at the name? great name, looks so perfect, too! Granola is one of my most favorite foods!! This granola looks fab, perfect for a sunny breakfast morning!